net framework 3.5 is already included on windows 7, 8 and 10. But motk likely you are installing on a server windows or custom windows edition. To solve this, install net framework 3.5 and run setup again. I uninstall 4.6 and install 3.5? No you dont need to unistall net framework 4.6. 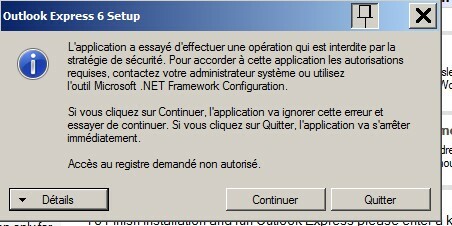 But: after a translate i did on your attached image, the error is not about missing net framework as i thought but a security error that has to do with your operating system configuration. Most likely you have a server operating system, you can try presssing "Continue" but there may be changes needed on your server in order oe to be installed correctly. This is not guaranteed because Server operating systems are tottaly different os from "normal" windows, each one has different settings, roles, and so on. Are you sute its Windows 7? is so, just press continue button. No problem about keys, just contact me at runasxp@gmail.com sending your keys and i will reset them for you. Then i guess that's a net fremawork issue, you can try uninstalling net framework 4.6. Since you are on windows 7, there is no need to install net framework 3.5 because it is already installed on win 7 by default. Hi. I cant install OE because it says I dont have NET Framework. I just installed windows 10 today and do have it. - I got choice try install Net framework 3.0 or Dont install it. If I click on Dont install it OE will not install. If I manually try install Net framework from the link above win10 says I already have newer version. I tried reinstall the newest version of Net framework and install the 3.5 version but I got the same error message when try install OE. And I installed the update disabler before I tried install OE. Maybe thats the problem? Yes maby update disabler dont allow installing net framework because on windows 10 net framework is being installed as update. Do not uninstall update disabler, run update disabler again and turn on updates, install net framework and try installing outlook express again. finally run disabler again and turn off updates.